There are some days when all you can do is think of a dish that you really want. Those “I gotta have it” days. In my case, I had a hankerin’ for some shrimp and grits and I thought I’d give it the ole’ college try. Shrimp and grits is really pretty simple to make. For some reason, I stumbled upon a handful of recipes that claimed that making this dish hovered around moderately hard to difficult (don’t believe it). The trick is to use fresh quality ingredients, season appropriately, and make sure that you’re using good quality stone-ground white grits. Cheese, cream, and butter are surely your best friends; your reliable dorm-mates, if you will. And the use of your specially concoted spice blend will have Emeril saying “damn!” instead of “bam!” for having not thought of this combo himself. I then made a couple of strips of thick-cut bacon (I don’t really need to explain how I made bacon, do I?) before prepping the shrimp (peel and de-vein). Set the cooked bacon on a paper towel to drain, then give it a rough chop. Next you’ll need to rinse the shrimp and set them aside. Pre-heat a cast-iron skillet with two tablespoons of safflower oil until barely smoking. As the skillet heats up, toss the shrimp into the spice blend, making sure to get as much coverage as you can, then sautee shrimp in skillet over medium heat until barely opaque. At this point, (assuming you’ve been stirring your grits constantly), your grits should be done (20 minutes-ish). Stir in the cheddar cheese and turn off the heat. Add a teaspoon of unsalted butter to your shrimp and toss– turn off heat and toss in bacon bits. 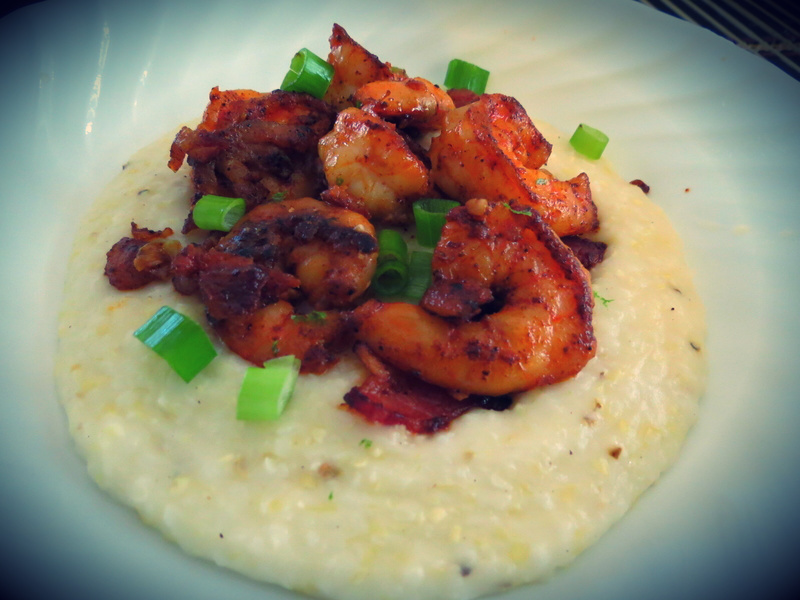 Serve shrimp on top of a bed of grits with some chopped scallions. For a little extra bite, a light dash of hot pepper sauce on top does the trick. A simple supper with loads of flavor. That looks so tasty! I really want to try grits – one doesn’t tend to come across them in Britain.